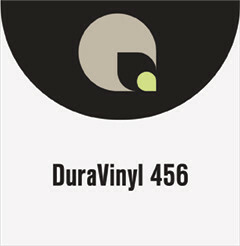 DuraVinyl 456 is a 3 mil calendared vinyl film. Features a 90# Air Flow release liner. The Air Flow release liner embeds channels into the adhesive for easy application on to any surface without bubbles and wrinkles. DuraVinyl 400 Series are 3 and 5 year outdoor durable films. DuraVinyl 400 Series is an outstanding choice for a variety of applications including barricades, window graphics, trade show and point of purchase displays.